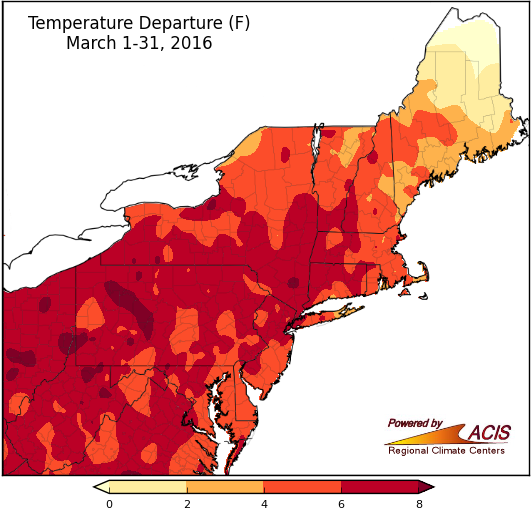 March was another warmer-than-normal month for most of the Northeast. Average temperatures for March were 2°F to 8°F above normal for a majority of the region. The northern half of Maine was a little cooler, with temperatures ranging from slightly below normal to 2°F above normal, while parts of West Virginia, Pennsylvania, and New York were a little warmer, with temperatures greater than 8°F above normal. 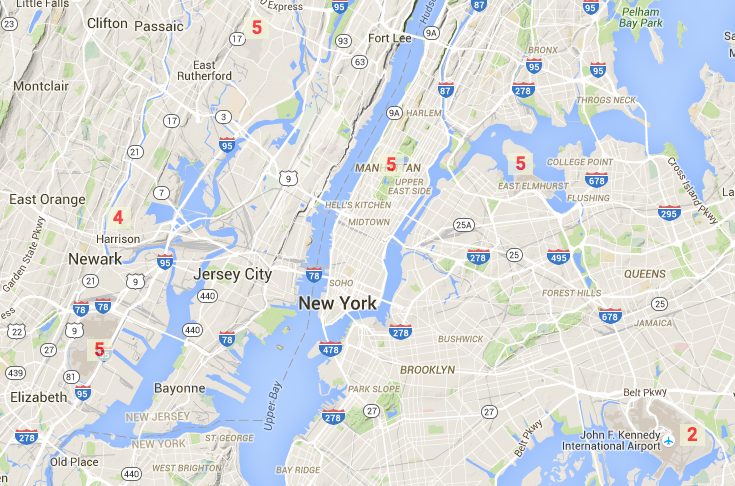 Twenty-seven airport climate sites had a top 10 warm March. 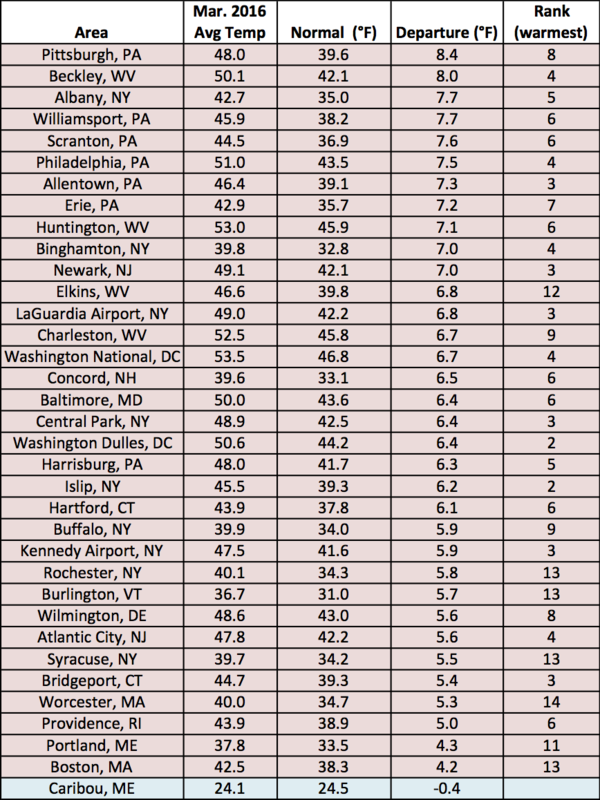 Of the 35 major Northeast airport climate sites, 34 ranked the month among their top 15 warmest. Temperatures at those sites ranged from 4.2°F to 8.4°F above normal. None of the airport climate sites have a normal high of 70°F in March; however, all but two sites saw a high of at least 70°F this March. Numerous sites ranked their number of days with a high of at least 70°F among their top 5 or 10 greatest (for March). Kennedy Airport, NY only had two days with a high of at least 70°F, but it was enough to tie their all-time record (with several other years). 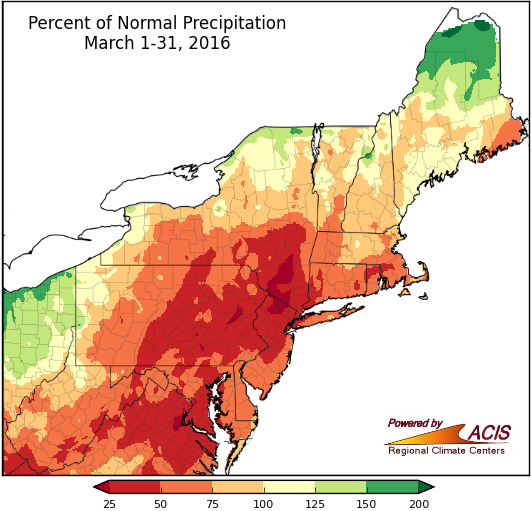 A large portion of the Northeast saw near to below normal precipitation in March. March precipitation ranged from less than 25% of normal to more than 150% of normal, with a majority of the region seeing 25% to 125% of normal. Parts of southeastern New York and northern New Jersey were the driest at less than 25%, while the northern half of Maine and parts of northern New York were the wettest at greater than 125% of normal. 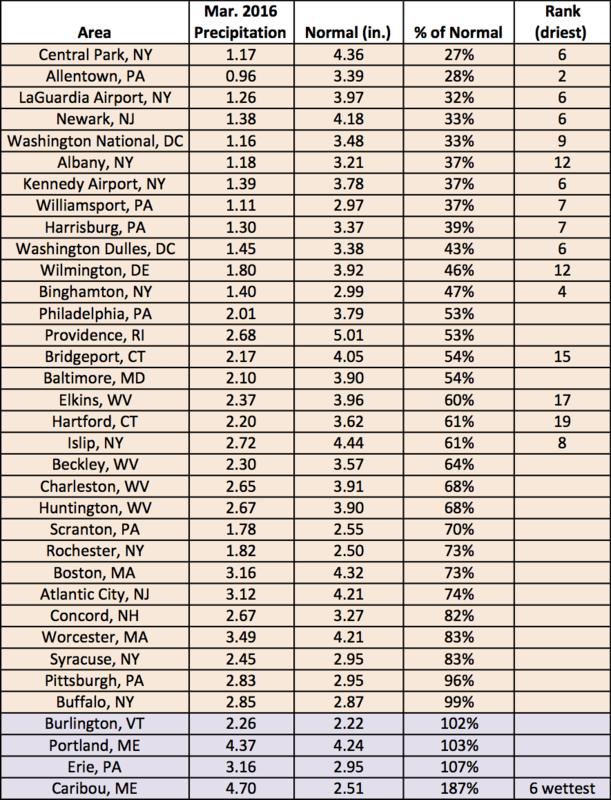 Thirty-one of the airport climate sites were drier than normal, with 16 of those ranking the month among their top 20 driest. Precipitation at the airport climate sites ranged from less than an inch in Allentown, PA (2nd driest March) to approaching 5 inches in Caribou, ME (6th wettest March). 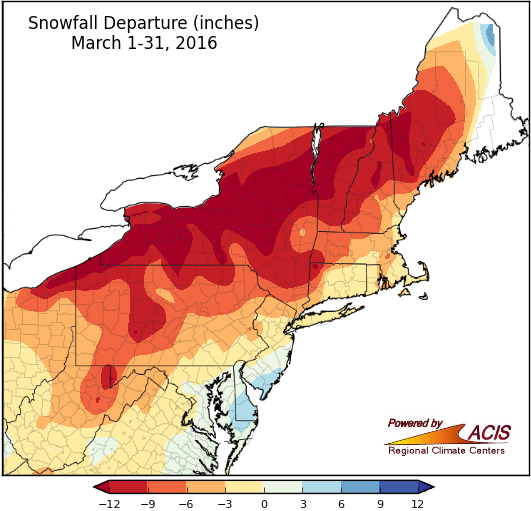 March snowfall was near to below normal for most of the region. Snowfall ranged from more than a foot below normal to more than 6 inches above normal during March, with most areas below normal. The largest deficits, which were greater than a foot, stretched from the northwest corner of Pennsylvania across New York and Vermont and into parts of New Hampshire and northwestern Maine. The snowiest spots were in northeastern Maine, where snowfall was more than 6 inches above normal, and in parts of eastern Maryland, southern Delaware, and southern New Jersey, where snowfall was 3 to 6 inches above normal. Thirty-one of the airport climate sites saw below-normal snowfall, with 12 of those ranking this March among their top 20 least snowy. 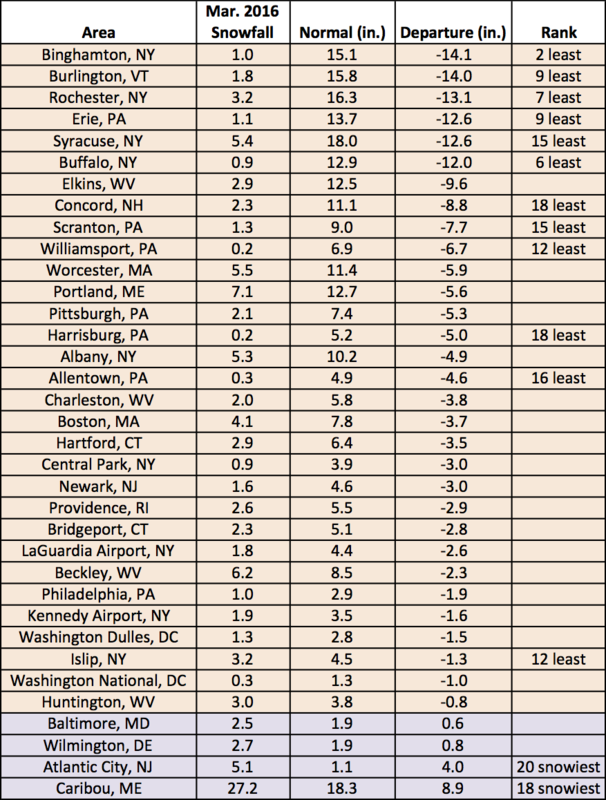 While a majority of the airport climate sites saw near to below normal snowfall, Caribou, ME and Atlantic City, NJ both ranked the month among their top 20 snowiest. It’s no April Fool’s joke - April could be cooler than normal for much of New York and New England! April may not take over where March left off. According to NOAA’s Climate Predication Center, there’s an increased chance of below-normal temperatures for much of New York and New England and equal chances of below-, near, or above-normal precipitation for the region. In the short term, some areas could pick up at least an inch of snow this weekend. NOAA’s Weather Prediction Center map shows the chance of seeing at least an inch of snow from Saturday afternoon through Sunday afternoon.